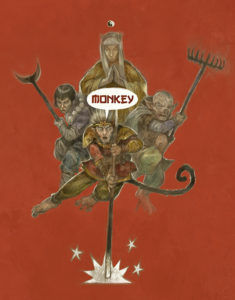 I am proud to announce The Ministry of Thunder, An adventure book for Monkey: The storytelling game of the Journey to the West. 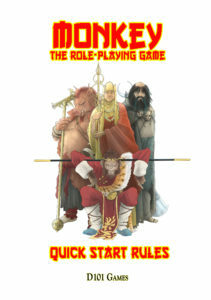 A collection of five adventures forming a mini-campaign playable over many sessions. Take your Immortals from criminal outcasts who reform themselves through service to the Ministry of Thunder. The Queen of the Western Heaven’s favourite mortal Painter has gone missing. Nobody seems to care or know where he has gone. The Queen arrives at the Ministry of Thunder to demand its agents recover him. The Ministry says “you say jump, we say how high” and assigns its best agents to the job. Yes that’s you scruffy lot, get yourselves down to Earth right away! The Abbott of the Buddhist Temple of Golden Harmony is found dead in his room. Who is responsible? What foul plot is afoot? What has the carp in the Temple pool got to say for itself? Whatever the cause, it is up to you and your immortal companions to sort out this mess. A number of Magical items have gone missing from the Treasury of the Dragon King of the Northern Ocean. The Demon of the Black Lagoon is implicated in their theft. As agents of the Ministry of Thunder, it’s your job to investigate. So quickly travel to the undersea court of the Dragon King, then through the Octopus’s Garden to the Black Lagoon to apprehend the miscreant demon. Heavens on Fire! 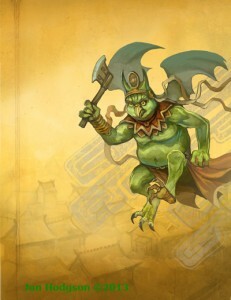 The Ministry of Thunder is called in but Minister Lei Gong’s modesty prevents him from dealing with the case in person. That’s where your disgraced immortals come into it. You must go where terrifying giant bat winged, bird headed Gods of Thunder and Lighting refuse to tread. The culprits must be caught and brought to JUSTICE!